The trend toward more electric bus solutions is growing due to the wide range of benefits, including reduced fuel use and its corresponding emissions and decreased maintenance expense. To make the transition to more electric a smooth one, from electric accessories through full zero-emission, transit operators look to a company that holds nearly 200 patents in electric and hybrid technology and delivers system integration as a core competency to ensure operational success. BAE Systems has been bringing innovative electrification products and solutions to advance vehicle mobility, efficiency, and capability to transit, military, marine, and rail markets for two decades. 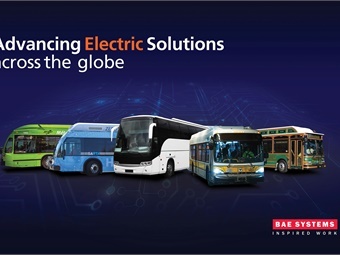 As a world-leading supplier of hybrid and electric solutions for the heavy-duty transit bus market, BAE Systems spans the globe, operating in major cities, such as London, Paris, New York, Seattle, and Hong Kong. This fall, BAE Systems will deliver its 8,000th propulsion system to the heavy-duty transit market. Recognizing that not every transit agency can, or wants, to make a transition to a full zero emission fleet, BAE Systems offers near-zero and zero-emission choices. For those looking for zero-emission solutions, BAE Systems has both battery-electric systems and hydrogen fuel-cell systems that use the same common components as its hybrid systems. Operators looking for electric travel but not quite ready to invest in charging or fueling infrastructure can choose from two hybrid-electric options, Series-E and Series-ER, which offer more engine-off time and significant full electric travel. Both have stop/start functionality, but Series-ER allows electric travel without the range challenges. To round out operators’ choices, BAE Systems now offers electric accessories on conventional (diesel and CNG) powertrains, and a parallel hybrid-electric system that provides clean, quiet, and efficient propulsion for motorcoaches. Setting up a multi-client electronic fare management (EFM) system in the Tampa Bay Area. This past September, California enacted Senate Bill 100 which requires that the state’s electricity come from 100% greenhouse gas-free sources by 2045. Pledge is a coordinated, international effort championed by CALSTART and aimed at dramatically reducing emissions from trucks and buses in high-potential markets. If approved, the grant will provide the funds needed to take the project from an exciting vision to a job-creating, pollution-reducing reality within five years. The partnership led by the Los Angeles Cleantech Incubator will collaborate to reduce statewide greenhouse gas emissions and regional air pollution. Public transit agencies and businesses voluntarily choose to join the APTA Sustainability Commitment program and pledge to implement processes and actions that create continuous improvements in sustainability.